List of Passers: DepEd 2016 ALS Accreditation and Equivalency Test results - Balita Boss! 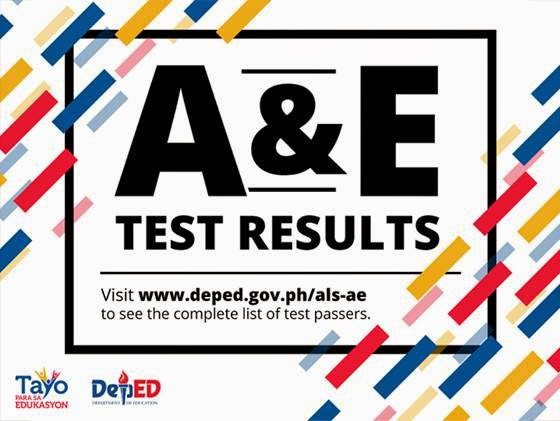 The Department of Education (DepEd) released the official results of 2016 Alternative Learning System Accreditation and Equivalency (ALS-A&E) Test. The Bureau of Education Assessment (BEA) of DepEd conducted the Alternative Learning System Accreditation and Equivalency (ALS A&E) Test on November 19, 2017 for Luzon cluster and on November 26, 2017 for Visayas and Mindanao clusters. On March 2, DepEd Secretary Leonor Magtolis Briones adjusted the passing score of the 2016 Test from 75% to the generally accepted passing score of 60%. For Elementary Level, click this link (http://www.deped.gov.ph/node/824102) to view the list of passers. For Secondary Level, check below the list of passers. Or, click here to download the PDF file of Secondary Level qualifiers.